....they are some of my very favorite colors! I have a few cards to share with you today that use these colors. So, let's get started. This first card is for Challenge 13 at the Everything But The Kitchen Sink blog. And it has pink & aqua mixed with kraft....an even better color combo! Yum! Instructions: Fold kraft paper in half to make card base, and round the bottom corners. Round the bottom corners of a pink heart paper block, and adhere to the bottom of the card. 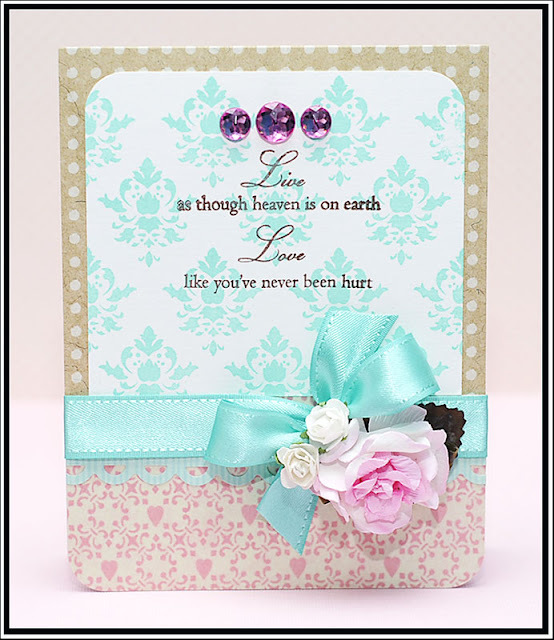 Punch a scalloped border to aqua striped paper, and adhere to the top of the pink heart paper. 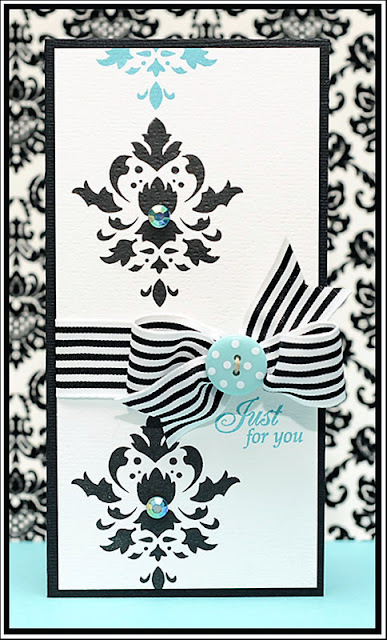 Stamp the damask pattern and the sentiment to a white cardstock block. Round the top corners and adhere to the front of the card. Tie ribbon around the seam, and top with 3 paper flowers. Accent the top of the card with three pink jewels. This next one is based on the Sunday Sketch at 365 cards, and on challenge 25 at the Play Date Cafe (use black & white with a splash of color). I love how this one turned out with just the little splash of aqua in places! Instructions: Fold black cardstock in half to make card base. Stamp the damask design to the left side of a white cardstock block. Tie ribbon around the middle, and attach a button to the bow with twine. Adhere the entire block to the front of the card, and accent the two black damasks with a jewel. Stamp the sentiment directly below the bow. And one last little card that has a whole lotta pink and white. This one is based on Sweet Sunday Sketch 65! Instructions: Fold white cardstock in half to make card base, and round the bottom corners. Emboss the front using a Cuttlebug and Victoria embossing folder. 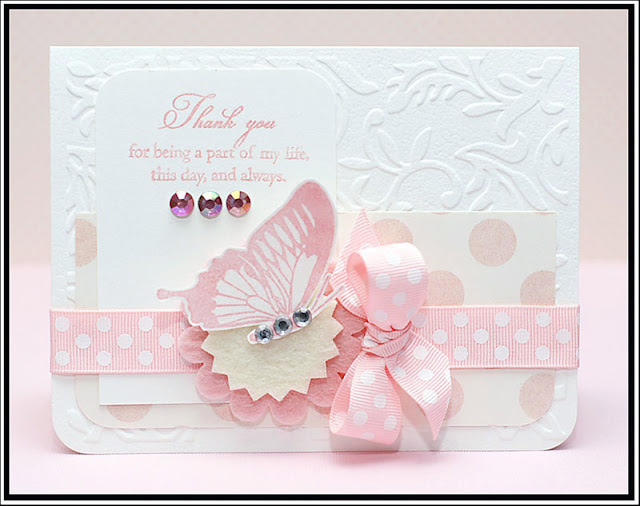 Round the bottom corners of a pink dot paper block, and adhere to the bottom of the card. Stamp the sentiment to a white cardstock block. Round the top corners and adhere to the left side of the card. Adhere three pink jewels directly below the sentiment. Tie ribbon around the bottom of the card, and add a felt flower to the left side of the bow. Stamp the butterfly on white cardstock and cut out. Adhere to the felt flower, and accent with clear jewels. oooh I'm in love with that 'just for you' card. So CAS and elegant. Oh my gosh Lea, you just keep on amazing me! LOVE what you've done here!! Girl..you are sooo rocking these stamps...every single card is GORGEOUS!!! lovely cards....great take on the 365 Cards sunday sketch! These are all beautiful Lea!!! Wow, I can't even say which one is my favorite! I am madly in love with the colors on each and every card but that black/white/turquoise is pretty amazing. Very pretty cards, love them all :) Great colors!! all three are BEAUTIFUL! Love them all:) Thanks for playing along with us at the PDCC! Lea, I love your style...the pink one really a lovely one..I also love the other two cards...so elegant..
Wow! I am blown away by these cards and your blog is terrific! You have some gorgeous creations throughout! So much inspiration. I am definately hooked! Thanks for the sweet comment on my blog! These are all just beautiful, Lea!! Absolutely stunning cards! I seriously love your blog! Thanks so much for playing along with EbtKS! Such amazingly beautiful cards, Lea. I love aqua and pink, too, and am thinking of painting one of our rooms in that combo. Love your works. Thank you for posting. I always love popping over to your blog...such gorgeous cards! Gorgeous! Congrat on winning the Sweet Sunday Sketch Challenge.